I’m Juha Ekman, and I’m here to help you get started with anime & manga art, make you more confident with your art skills and teach you new drawing techniques to get your creativity to another level. Do you imagine what anime & manga art combined with confidence in your skills can give you? That’s what I’m here to help you discover. I have been drawing for years already and went through an incredible transformation from traditional artist to becoming a digital artist. It wasn’t easy for sure and we all start from zero. So if you’re feeling behind – don’t worry. I’ll give you a fast start to anime art and how to draw digitally. I think we should start with, what is digital art and move to anime & manga art from there? What is Digital Art Exactly? "The most beautiful thing about digital art is its endless possibilities and the fact that those possibilities are always present." Digital Art is art that is produced electronically. I would say that it is produced with a drawing tablet or some other device that has a digital stylus and you can draw on a surface that translates the brush strokes to a computer. Digital art is something that you do traditionally but to an electronic surface. Like in traditional art, you draw to a canvas, paper or material of your choosing. In digital art, you only have a drawing tablet and a stylus. Stylus being the pen when thinking about drawing or a brush when thinking about painting. The most beautiful thing about digital art is its endless possibilities and the fact that those endless possibilities are always present. If you are totally new to this world. Let me be your guide for a short moment. In traditional art, you have all things in physical form. In digital art, you have those same things or extremely close to those same things in digital form. If you like to paint, the digital world offers those same brush strokes experiences but in digital form. Or if you like to draw, you have basically an endless selection of pencils on the art program of your choosing. And from there we get to the point of talking about art programs. Now, art programs are those that give you the ability to draw digitally. Popular art programs are Adobe Photoshop, Corel Draw, Clip Studio Paint Pro (my absolute favorite), Autodesk SketchBook Pro, PaintTool SAI and countless more. My recommendation falls to Photoshop and Clip Studio Paint. Clip Studio Paint being the winner for drawing. Next thing you need is a drawing tablet. Now, a drawing tablet is the thing that transfers your hand and body movements to the digital canvas. Yet again, there are countless drawing tablets in the market. My favorite and kind of a king in the market, is Wacom. Wacom Cintiq 12WX is the one I use. But there are many more like Huion, XP-Pro and so on. You can even use an iPad to draw on. As long as it has a drawing surface, stylus support and supports some art program. To get started with digital art. The very first thing you need is a solid hardware to get your vision to the place where you want to it take it. Many do drawings with just a tablet, however, if you truly want to get your art to another atmosphere, do get yourself a good rig a.k.a a computer. 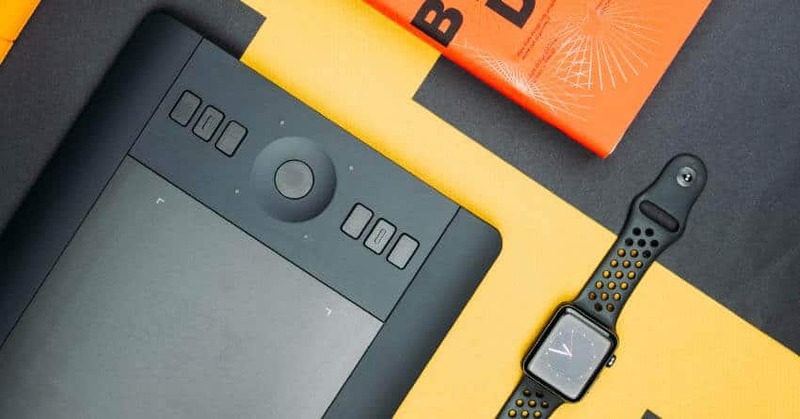 I have written rather extensively about the hardware you need to produce digital art efficiently and without interruptions. You need a fast RAM memory (don’t worry if you don’t understand this stuff yet, the blog post explains these in a more detailed manner). and a lot of it. I prefer to have 32Gb or more. A display is probably one of the most important things you need. You have to have good color accuracy or color gamut as some call it. Meaning that the display actually shows the colors as you intended. Reds are shown as reds and not as magenta for example. You do not need a powerful processor to draw efficiently. However, when and if you want to do other tasks, like zipping files or video editing. You suddenly need a powerful processor. Do get yourself an Intel processor. Look for the latest model and pick either the best, second best or even the third best that is currently in the market and does not cost a fortune like some high-end models do. Around 300$ is the price range to aim for. A drawing tablet is the tool that transfers your imagination to the computer. So in that sense, you can’t draw without a tablet. There are various brands that sell digital tablets. I prefer Wacom tablets even though they do have their own low points but I think the pros beat the cons. If anything, I strongly recommend getting a tablet with a display. A screen where to draw. There are also tablets that do not have a screen but have a drawing surface. I wouldn’t go that road if I were you. Those are cheaper sure, but still, do avoid them. Just my own preference here but I like to see the brush strokes under my hand. 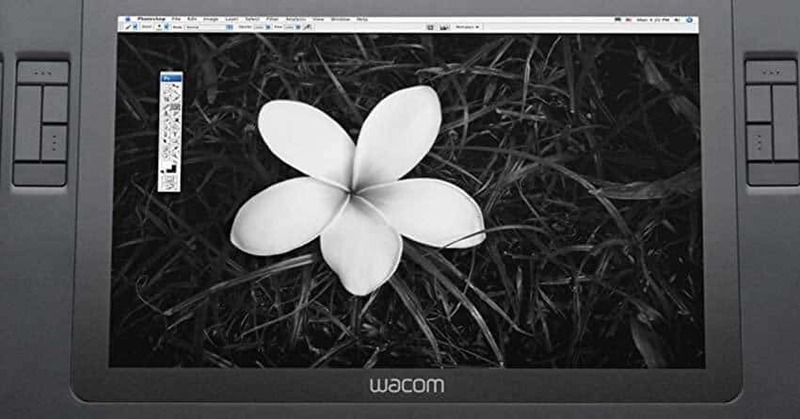 Wacom is my go-to tablet and Cintiq series if you decide to go with the Wacom brand. You can’t draw if there is no program to take your creative flow in. Art program is yet again a must to have if you plan on drawing anything digitally. Now, what I do recommend is that you first decide what kind of art you are going to be producing. Is it paintings, drawings, vector illustrations or perhaps something between? As there are many art programs available in the markets. There is also strengths and weaknesses in every one of them. Some do vector illustrations better than others, some are specifically made for sketching, some are spectacular at painting and some are focused on anime art. So there really is a plethora of solutions available for each of us. As Okuha is focused solely on anime art. I will be recommending things from that perspective. This is my go-to program for drawing, coloring, sketching and doing that sweet line art. This program is especially designed anime and manga artists in mind. Drawing the sketch of a character is just like doing it traditionally, the pencils/brushes are made so that they feel just like you were drawing to a real paper. The feel is just correct. Like precisely like it should be. Also, the other features, like coloring, cel shading, all have been thought out. There are just the right tools to make your drawing experience feel so effortless. Now, Adobe Photoshop is how would I say, a kind of king of the art program markets, whereas Wacom was the king for the drawing tablets. And there is a reason for that. One being that Photoshop has everything you need. It just has everything and it is ever evolving. It has a massive amount of brush customization options (Clip Studio Paint also has though) but what sets it apart is the available options on how you can modify and tweak colors and forms in your drawing. I do all of my final adjustments in Photoshop just because the program is so easy and powerful to use. You truly can make anything with this program. In that sense, this is kind of one solution to all. If I would buy one program, I would choose Photoshop, if you have the option to buy one more, get Clip Studio Paint. I haven’t used Corel Painter myself other than few times but have I have experienced and seen is that this program is the one to use when you are doing more painterly things. If you like to paint and truly want to become a master anime art painter. Choose Corel Painter. I think this program is the best for painting. Hands down. This kind of a cheap version of Clip Studio Paint or that is at least how I see it. However, this program is powerful and I mean this truly does have almost everything you need to create that anime art of yours. If you are on a budget, I would definitely go for Paint Tool SAI. You won’t regret it. It might not have all the fancy features of Clip Studio Paint, like 3D modeling but it does the job of delivering a smooth drawing experience. These walk hand-by-hand more than often. However, there is a small difference between the styles. Now, you see. Manga as a style is the same as anime except manga is done in black and white. Usually serialized in this mini books that are read daily in Japan. Manga can be seen as the roots of the anime style. Anime series is always or at least almost always based on some manga story that is first experienced in book form. Anime style can be summed as a definite form of manga. Colors, shading, and rendering inserted to a beautiful base that manga creates. I see manga as black and white. With no color added. 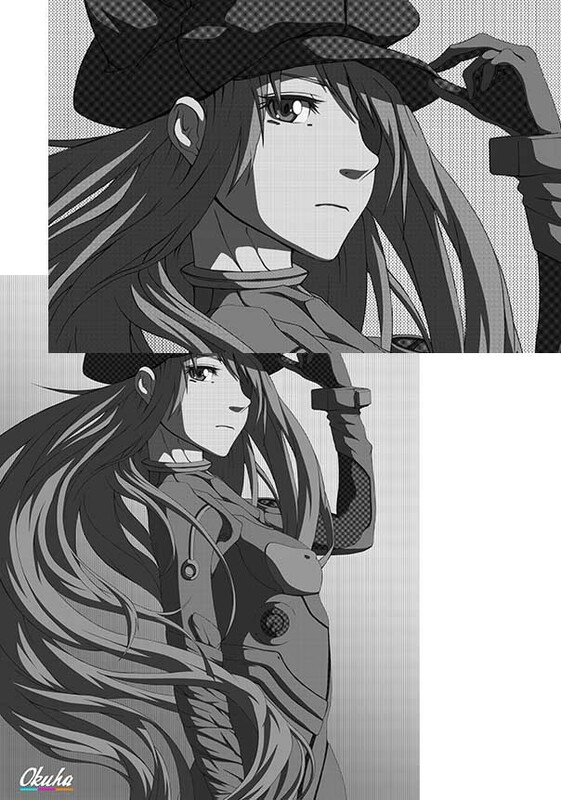 Manga uses halftones to differentiate elements from each other. As you can see below I have used different halftones to achieve different results. Some parts are darker and some lighter. Creating a contrast between elements. This was easily achieved using clip studio paints halftone library. Clip Studio Paint is an art software with manga and anime artists in mind. Anime art is manga art in overdrive. Anime art adds the color aspect to the drawing. I would say that cel shading was the next art form after manga art considering Japanese anime and manga art. 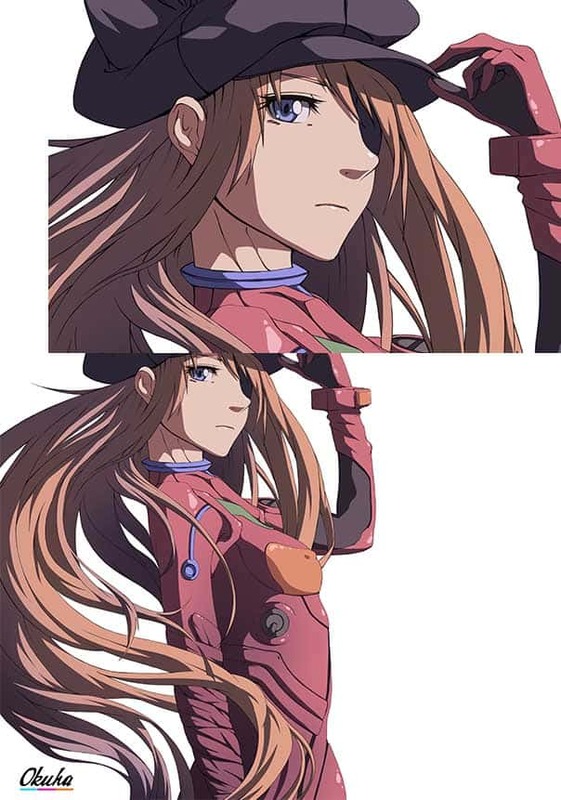 Meaning that cel shade was the technique used to create anime series from manga books. So in that sense, it was the way to get color to the manga art and create a new form of art style. These days there are so many different ways to paint and color anime art. So cel shading is only one style among others. Though it is the style I love the most. Simple yet so striking. Or something along those lines. Anime & Manga art for me is big eyes, flowy hair, small mouths, more than cool poses, unbelievable costume designs, superb color choices, more than laughable face expressions and this joyful mood all around. Anime art is just something that gives you smile to your face. Anime art is a passion of mine and something I like to share with like-minded persons, like you for example. Anime art gives you the freedom to draw unrealistic realistically. Bending the fantasy and the real world in a unique way that only anime art can do. I have collected few essential thoughts to keep in mind when starting with anime art. Anime style is truly its own style and it has some key points to take into consideration when starting out. I believe drawing awesome line art is one of the key skills you need to master when drawing anime art. Think about Project Triggers animations or Pokémon. The designs all have boundaries also known as lines. Pikachu does have lines and they are all hand drawn. The lines create the structure for the creatures and characters. Lines also give the character a personality. It also creates a style for your drawings. Oh, how I love colors! I mean, just think about Studio Ghibli. How could I not mention them? Every time I think about colors, I always see Studio Ghiblis animations rolling on my head. I think anime colors can be divided into two categories that truly differentiates styles from each other. Saturation. Just compare Ghibli production (Spirited Away, Howl’s Moving Castle etc.) to Ufotable (Fate/Stay Night). You can see a clear differentiation on how saturation is used and how it creates a very different feeling to anime and to the anime art style in use. I prefer the Ghibli colors but experiment every now and then with the saturation. As said before, line art is one of the key skills to have when moving on with anime art. There are countless ways on how to draw and color anime illustrations. I have always liked to focus on line art to make it part of the drawing and also to guide the coloring process. The next thing that has always caught my eye is the cel shading. Cel shaded art, it just pleases my eye the most. Now, there are many awesome artists out there that do not use cel shading and I still like their art. It’s just that cel shading always gives me the deepest emotions. Anime is all about breaking the rules of the real world. Eyes, mouth, facial features. Everything in anime is slightly modified from the real world. One can be close to the real world but usually, the eyes give away and reveal the style to be manga/anime. Also, the hair is something that is very special to the anime style. Either it is way too big, way too flowy or the hair has a structure that is not possible to achieve in the real world? Anime kind of breaks the rules of reality and creates another, more beautiful reality instead. "I wish I knew these when I was just starting out with digital art. That's why I wrote these, so you would know." When I was starting with digital art and everything was new to me. I didn’t know what to think about digital art. I was scraping information from here and there. Not kind of getting a good picture of how to approach this all. I have collected 5 of the most important things a think every aspiring digital artist should know. There is a lot more to know than just these 5 tips, but I think these give you an excellent start to digital art. Before you get your art gear moving and start your art journey. I would like to help you in another way. You see. I post new content to this site as frequently as possible. When that update happens there is no way you could know about it. Well, other than of course visiting my site to check the new content available. So if you would like. I can send those updates to you via email. You can subscribe now by clicking the button below. I cannot wait to help you get started. I’m truly excited that you found here. I’m here for you to be your guide and also a friend when in need one. I want to hear your story and how you got into art. What makes you excited about art and also what you would like to improve on. I want to know how I can help you more. We experience art in so many ways. And, I want anime art to be our experience, together. I do my best to answer every and all email. I try to be honest with you and also give you the best advice I can with my knowledge. In everything I do here in Okuha, I truly want to make anime art stand out and feel a special part of the art world. Join the hundreds of other anime art fans and enjoy the content delivered to your inbox.